Christopher Alonzo, a Kennett Square resident, is one of the three co-chairs of the Landscapes3 Steering Committee. Alonzo is the president of Pietro Industries, a third-generation family farm in Kennett Square, and the chairman of the Chester County Agricultural Development Council. 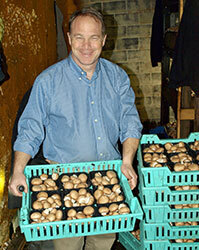 As a mushroom farmer, his areas of interest include agriculture, business, and workforce housing. He believes Chester County is great place to raise a family. “Landscapes3 is a great opportunity to allow the residents to voice their thoughts on our county’s future planning and it comes around every 10 years,” Alonzo said. For more information about Alonzo, click here. The Chester County Commissioners established the Landscapes3 Steering Committee in late June as part the development of the county’s next comprehensive plan. The steering committee will start meeting this fall to create the plan’s vision and goals. The other two steering committee co-chairs are Matthew Hammond, executive vice president of Traffic Planning and Design, Inc. and the chairman of the Chester County Planning Commission, and Molly Morrison, president of Natural Lands and a member of the county Planning Commission.